Welcome to the FIRST EVER FEATURE FRIDAY! Over the past couple of weeks, I had a new idea to add some more excitement to this blog by featuring content from other bloggers. Lately, I had been noticing that I share a lot about my own personal life and my family, but I hardly ever share anything about my friends! Coinciding with my new Feature Friday idea, I thought I would go to brunch with my friends, Alyssa and Carrie, who blog for Basic Brunch. Alyssa on the left and Carrie on the right! The following post is a feature from these amazing two women about our experience and touches on how their brunch dates contribute to their own well-being! Enjoy! It’s Friday and we have a pleasant surprise. 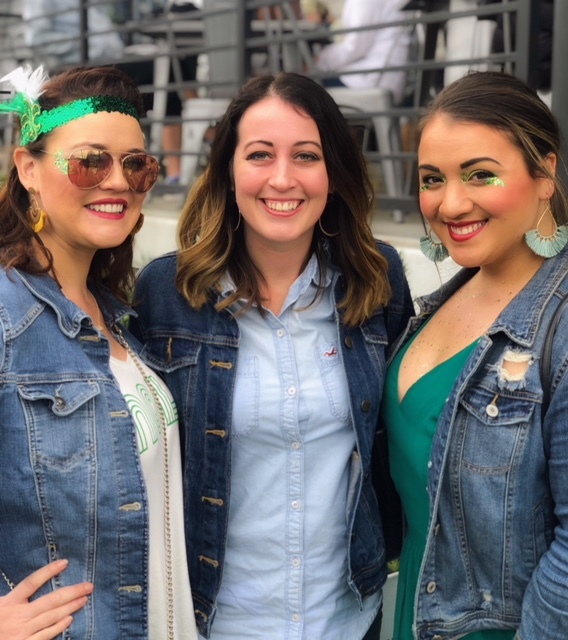 The morning of the Irish Channel parade, we joined one of our favorite bloggers to brunch; my dear friend, Sarah Ford Mozingo! Sarah’s blog primarily focuses on living a better life by sharing experiences about faith, family, marriage, and fitness and wellness. We decided to take her to Bearcat Cafe located at 2521 Jena St. It’s location is perfect, as it’s only a few steps off Freret St. 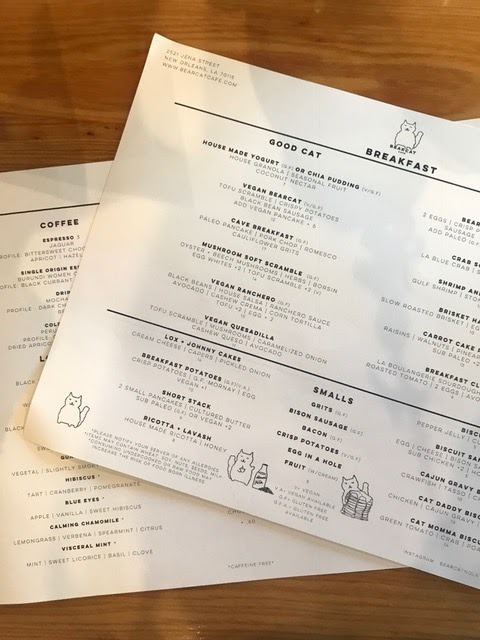 The breakfast menu is divided into a Good Cat section, which offers lighter fare, and a Bad Cat section that features more hearty, indulgent dishes. 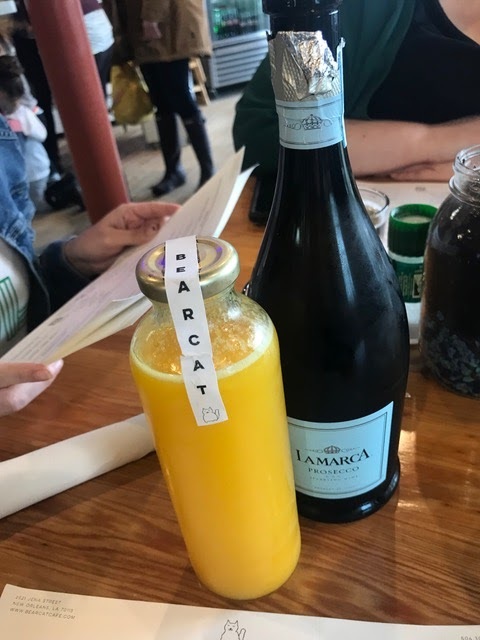 Bearcat Cafe does not have a bar, but good news… you can bring your own bubbly and they will supply you with a bottle of fresh squeezed OJ. While looking over the menu, we all were torn with the decision: Good Cat or Bad Cat? Every plate sounds absolutely delicious. We chose to share an order of biscuits to start with as we continued to look over the menu. 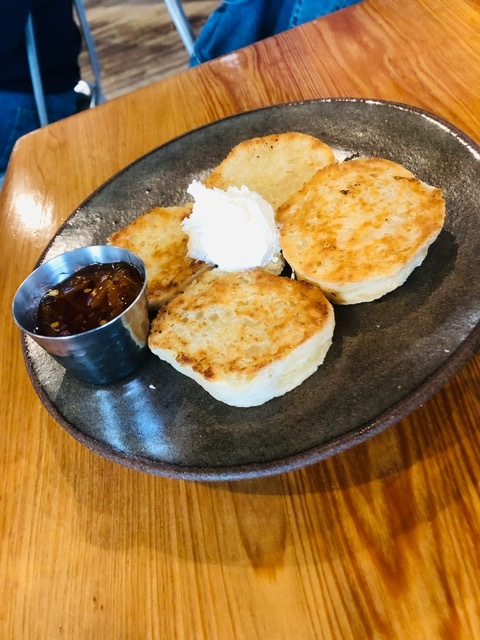 The biscuits were crispy on the outside with the perfect fluffiness on the inside and served with housemade pepperjelly and butter. Finally, we made our decisions. Our table was filled with tasty entrees, which included: The Crab Scramble, The Breakfast Club, The Cave Breakfast, and The Mushroom Soft Scramble. Not one complaint from our table, and the portions were absolutely filling. Having Sarah join us for one of our brunches was wonderful. We got to talking and started to discuss the reason Carrie and I brunch so often. Why do we take the time to take pictures, post to Instagram, and write blog posts every so often? And, we came to this conclusion: Many of us have so many responsibilities in life that we forget to take care of our personal needs. After a long week of working, events, cooking, and cleaning, figuring out what to do with your weekend can be exhausting in itself. Some might plan to stay in and catch up on sleep, while others may want to binge their favorite shows. Yet, we enjoy making brunch plans. Brunch to us is more than just a meal. Brunch allows Carrie and I to catch up with each other, check-in, vent, and then enjoy something we both love: mimosas and food! Becoming Basic Brunch has been a journey. I started this alone at first, and then found it difficult to keep up with. Then one day I thought, why not ask Carrie to join me? My sister and I may be years apart, and we definitely are in different chapters of our life. But somehow, we make it a point to go to brunch, indulge for a minute, and just be ourselves. Basic Brunch is more than a blog for critiquing, and it’s more than just sharing the experience with others. Basic Brunch is a bonding experience. It’s our little version of self-care. We want to point out that self-care is a VERY important part of wellness. Life is hard. We want to invite you to find what makes you happy and just do it. Let us know what you do to promote wellness in your life in the comments below. We hope enjoyed reading up on our St. Patrick’s Day brunch, and stay tuned for more posts on our Instagram! Sarah here! I just loved how this post talked about how their brunching experiences are a big part of how these women incorporate self-care into their weekly routine! How much fun must it be to go to brunch every week with your sister and share blogging about it together? I think finding a balance between all our other obligations and enjoying some fun is so important for us to achieve joy in our lives! Do you love to brunch? What other creative ways do you incorporate self-care into your routine?